Why we didn’t (and won’t) declaw our cats. My favorite cat behaviorist, Pam Johnson-Bennett, has written several articles detailing why declawing isn’t something that cats should be put through. Additionally, declawing is ILLEGAL in most western European countries and the UK. The medical reasons aside, my experiences have led me to believe that declawing is absolutely not necessary and is usually harmful. I grew up with Siamese cats. When my sister and I were little, Santa brought us two kittens one Christmas. (While we loved the kitties, I do not advocate giving animals as gifts; more on this another day). These cats, two sisters, were front-declawed as a matter of course at the same time as they were spayed. They were always super sweet kitties, but they quickly became overweight and have been for their entire adult cat lives. I wholeheartedly believe that they wouldn’t be nearly as overweight if they still had their claws. 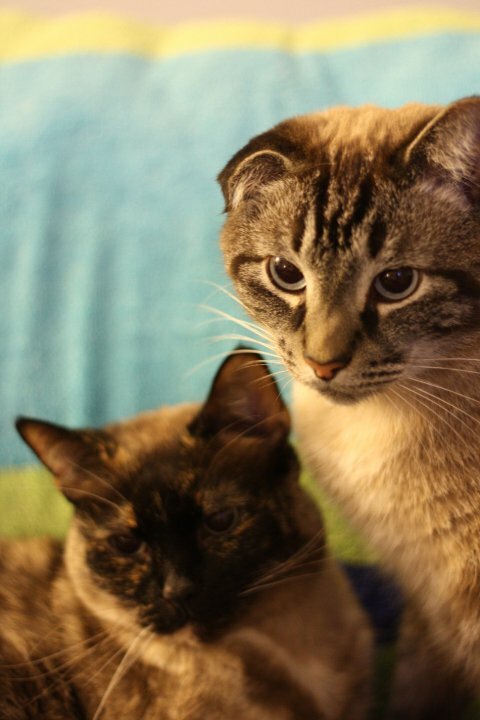 Additionally, these cats have other medical and behavioral problems (probably because of the inbreeding that is common in Siamese cats), which are exacerbated by the lack of claws. Example: kitty associates pain of claw amputations with using litter box and refuses to use litter box. Luckily, my parents are the type of people who don’t get rid of their pets, even after they’ve had to replace all the carpet in their house with hard floors, but one of the most common reasons that people give up their cats is because the cat pees outside the litter box. Imagine how many cats could be saved from the shelter if we understood that some cats associate the pain of declawing with the box and skipped declawing all together! When I adopted Zeda from Siamese Rescue, I signed a contract that included a stipulation about never declawing. I was beginning my first year of graduate school and had done quite a bit of research into cat psychology, so I was all about the contract. I was super prepared with tons of scratching items for my 500 square foot apartment. Zeda arrived and immediately knew what to do. I understand that a cat knowing how to scratch isn’t necessarily the norm, and I got lucky, but what it comes down to is giving kitty plenty of options. When we got Duncan a year later, he followed right along with Zeda’s example. Now, when we walk in the door, the first thing we see is Duncan, jumping on the scratching pad and going to it, waiting to hear us praise him. To train a kitty, make sure you have tons of scratching options, at least two per room in your house. (Our living room has five scratching areas, in each corner, and on either side of our couch, which is especially tempting for the scratching). Whenever she scratches in the right place, just give her lots of praise and petting and maybe small treats and use a cue like “Good scratching,” and soon she will associate the good feelings of scratching and praise with the right area. If she’s not sure where to scratch, you can use catnip to entice her to the scratch pad or post and show her by scratching your fingernails on it. It’s also helpful to have a scratching pad (or several) in every room, in case the urge to scratch comes on strong and she needs to scratch something in that room right then. Many experts recommend sisal scratching posts for kitties, but our kitties also like cardboard scratching pads that lie flat on the floor that you can pick up at Trader Joe’s for $6.99. We have a sisal mat that we also got at Target (~$12) that we nailed with four small nails into the wall, so they have a vertical scratching surface and horizontal ones. It’s generally not helpful to get scratching posts made of carpet or fabric because those surfaces could be elsewhere in your house that you don’t want kitty scratching and that’s confusing for them. If our cats scratch on the couch now, it’s only when we’re home and they think we’re not paying attention to them, and it’s SUPER EASY to get them to stop. We just go to their scratching pads and scratch our nails on it and say “Use your scratcher” in a fun voice and if they come over and use it then we tell them what good kitties they are and give them treats. They hardly ever scratch in inappropriate places, and our furniture is in great shape (aside from all the fur).